My Curly Knots: Omega 3's For These Curly Knots, Please! Home > Hair Health > Omega 3's For These Curly Knots, Please! Omega 3's For These Curly Knots, Please! A spoonful of fish oil is heading for your mouth. D. open up and say "Ahhh..."
If you're like me, you'd probably pick C.
Obviously, we don't consume fish oil for the flavor. And THANKFULLY, fish oils come in gel caps and fruit chews these days. But maybe if you realized the many health benefits of fish oils, you'd start clamoring for it, instead of running from it. Fish oils contain the Omega 3-fatty acids eicosapentaenoic acid (EPA) and docosahexaenoic acid (DHA). Fatty acids are important for maintaining the integrity of cell membranes, which are responsible for regulating what comes in and out of our body's cells. While these fatty acids are essential to the body, our bodies can not make them, which is why we need to get them through the consumption of fatty fish. And since most people in this country don't consume the recommended 2 servings of fatty fish per week, we need to fill in the gaps with fish oil supplements. 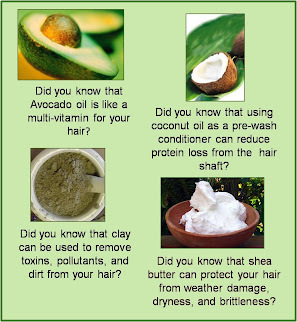 and you guessed it... hair health! Fish oils nourish the hair follicle by providing a source of protein for the growth of resilient hair, and fatty acids for the maintenance of a well-lubricated scalp. A deficiency in Omega 3's can lead to a dry irritated scalp, brittle lackluster hair, and in some cases, hair loss. Consuming adequate Omega-3's can assist in creating the environment necessary for growing brilliant and healthy hair. The hair will be more sturdy and flexible, qualities critical to hair health and length maintenance. There doesn't seem to be a specific recommendation for the daily intake of fish oil supplements in healthy people. 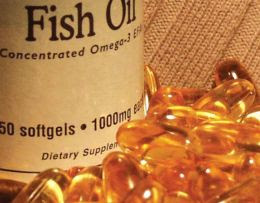 The general assumption is that you should be able to get what you need from 1 - 2 capsules of 1000 mg of fish oil per day. This can contain anywhere from 300mg - 1.4 g or more of Omega-3 fatty acids. The American Heart Association simply recommends including oily fish in the normal diet. Oily fish include tuna, salmon, mackerel, sardines, and herring. For those with heart disease, they recommend 1 gram (or 1000 mg) of supplemental Omega-3 fatty acids per day. There ARE adverse effects associated with the over-consumption of fish oil supplements, so please use moderation. More is not necessarily better. You shouldn't take more than 3 grams of Omega-3 fatty acids per day, unless you've been advised to do so by a physician. High levels of Omega-3's can contribute to thin blood that won't clot properly. It can also have an impact on blood sugar levels in Type 2 diabetics. Flaxseed oil is a good vegetarian source of Omega-3's, but its potency does not compare to fish oils. Flaxseed oil yields mostly Alpha Linoleic Acid (ALA), a precursor to EPA and DHA, and the rate of conversion is not that efficient. As such, one would have to consume about 6 times more flaxseed oil than fish oil, in order to obtain a similar benefit. Not all sources are created equal, unfortunately, so if you don't want to lose your money (or your lunch), choose carefully amongst fish oil brands. Fish oil by companies specializing in pharmaceutical-grade nutritional supplements are probably your best bet for quality. They already hold themselves to a fairly high standard, soliciting 3rd parties to analyze and certify the quality of their formulations. The capsules/gelcaps/softgels should be enteric coated, which means that they won't break down until reaching the small intestine. This should limit any annoying aftertastes if you burp. Look for a brand that contains tocopherol (Vitamin E), which is an antioxidant that serves as a natural preservative to prevent the fish oil from going rancid. Also, choose a brand that says the product is "unrefined" or "cold-pressed", as other types of processing can destroy or diminish the quality of Omega-3's within the capsule. Be weary of brands that don't list which fish the oils come from on their label. In my work as a Nutrition Sales Consultant, I've come to know that the brand Nordic Naturals is well respected amongst integrative medicine practitioners. Some companies even private label this brand. You can buy supplements directly from their website, but I found discount prices for some of their products at this website- http://www26.netrition.com/now_ultra_omega3.html . 650 EPA, and 450 DHA per serving. $23.75 for 60 caps, and $42.45 for 120 caps. You can also find the NOW brand of Omega-3's at this website- http://www26.netrition.com/now_ultra_omega3.html . 500 EPA, 250 DHA per serving. $10.99 for 90 caps and $19.99 for 180 caps (I've never used this brand, but I've seen it in several Chiropractor's offices during my visits for work). Also, if you already see an integrative or alternative medicine practitioner, you can ask them what brands they may recommend. I hope this helps, my dears! Nordic Naturals is the best brand but can be a little pricey; the price increases as the EPA and DHA amounts increase but the benefits are worth it. A quick fix that has worked for me is to get enteric coated and eat a meal after or mix the liquid in a smoothie or with your salad dressing.